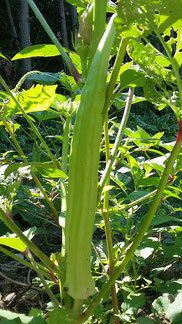 How does my garden grows from seeds to be shooting up these beautiful lady finger Ochros? Well, as the saying goes; if ye seek ye shall find and you did seek so now you are about to find out how does my garden really grow. Sounds kinda poetic doesn't it? These beauties are freshly picked from the garden and ready to go from any ones idea of culinary delights unto your plate and into your salivating mouths Note these may be used cooked or uncooked depending on your recipe, but we are not talking recipes today. On top of my Ochro pile or beside it to be more specific is my single “hot green pepper”. Please note that I just now copy righted that term so no ideas now for the throuls and pirates, haha. So this here is an example of what one might expect to see when the seedlings began to burst out of the soil while still in the indoors starter areas. Fantastic content in your article. I'm glad you found this helpful information.